Sipping Darjeeling tea with my toast and marmalade, I am looking out over a sunny, snow-covered mountainside. 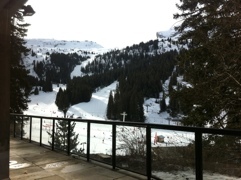 We are on holiday in Flaine, in the French Alps. The children have happily joined friends at the hotel’s kids club, from where they will soon leave for their skiing lessons; DH has taken his snowboard to catch a few early morning runs (Nirvana in his headphones, sunglasses on); and I am left to savour this moment of serenity. Even the waitress has been a cooperative component in the perfection – shortly after I sat down at my window table she closed off this section of the restaurant, leaving me alone with my ipad, the view, and an assurance that I was free to stay here as long as I wanted.